Postgraduate students from all six departments showcased their research at the last ever Graduate School Research Afternoon. The Faculty of Science Graduate School held their last ever Research Afternoon, celebrating the research carried out by postgraduate students. Staff and students from across the University enjoyed an afternoon of talks and poster presentations from PhD, EngD and MRes students representing all of the Faculty’s six departments. Professor Saiful Islam kicked off the afternoon with an entertaining and informative keynote lecture called 'Green Energy Materials in 3D (Batteries Included)'. 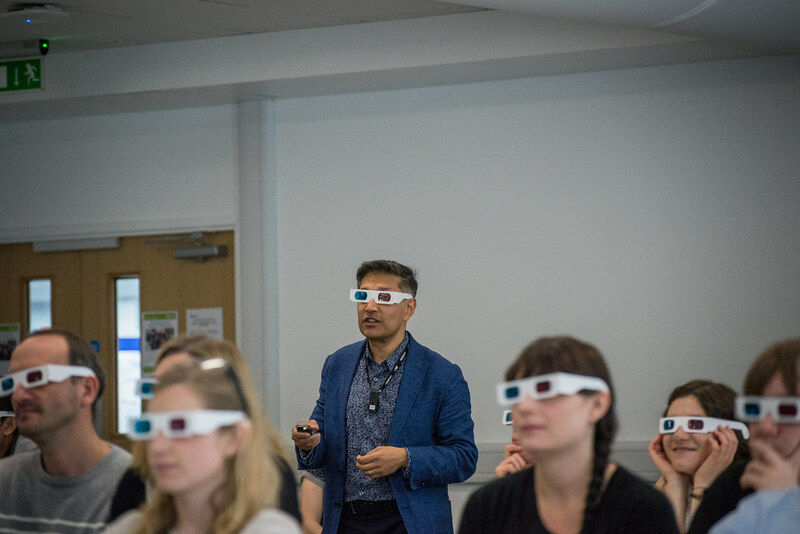 He talked about the challenges and developments in creating greener batteries while the audience viewed slides of crystalline materials through 3D glasses. This was followed by talks from PhD students in receipt of University of Bath funding and two-minute ‘lightning’ talks from poster presenters. The prize for the best talk, sponsored by Santander Bank, went to Chemistry PhD student Andrew McCluskey, for his talk ‘Putting Computers to work for large experiments’. Nathan Farrell, University Relationship Branch Manager from the campus Santander bank, handed over the prize and congratulated Andrew. Two prizes for the best posters went to Biochemistry PhD student Dragana Catici, who is researching what makes proteins change shape inside cells, and Pharmacy and Pharmacology PhD student Laura Newton, who is investigating how to detect heme in skin cells in order to improve sunscreens. The prizes were presented by Professor Jonathan Knight who congratulated the winners. He also emphasised that taking part in events like the Research Afternoon is important as interdisciplinary interactions stimulate new ideas and collaborations. During the afternoon there was also a charity cake sale which raised £225 for the homeless charity Shelter, in memory of Jim Caunt, a much loved colleague and supervisor who died earlier this year.